New emoji characters are approved on an annual basis as part of wider updates to the Unicode Standard. This page notes which emojis have been approved for release on major platforms. To stay on top of the latest emoji news at all times, subscribe to our free monthly emoji newsletter and podcast Emoji Wrap. Alternatively you can find frequent emoji news by visiting Emojipedia on Twitter and the Emojipedia Blog. Provisional emoji candidates for 2020 are being listed throughout 2019. 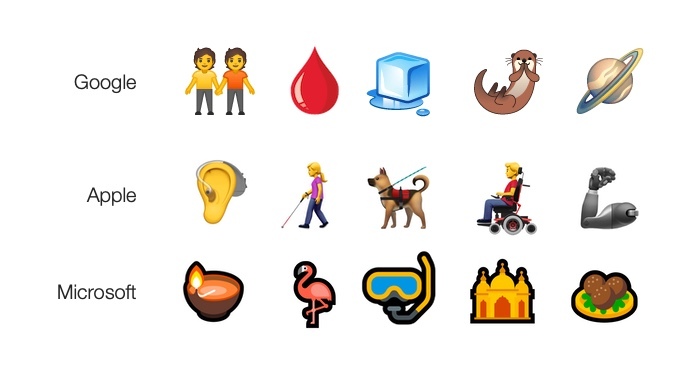 A final emoji list for 2020 will be released in Q1 2020, and may include proposed additions such as fondue, mammoth, worm, and hook. Emoji 12.0 is the new emoji list for 2019. Approved on February 5, 2019 with 230 new emojis, these are rolling out to major platforms throughout 2019. More about this update. Now available on Twitter (web). Emoji 11.0 was the new emoji list for 2018 which included 157 new emojis and is become available on most major platforms (including Stock Android, Samsung Experience and Windows 10) in the second half of 2019.
iOS 12.1 came out on October 30 and included the new 2018 emojis for iPhone and iPad users.